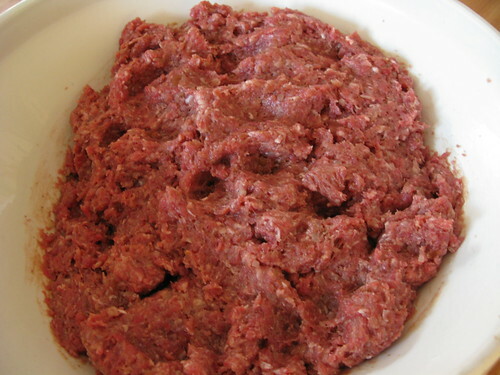 I decided to follow traditions with this year's batch of Christmas meatballs - no pancetta, no garlic, no parsely. 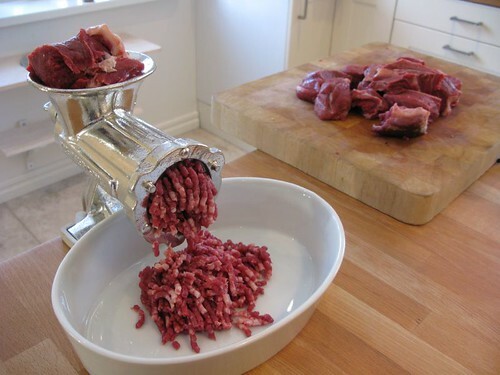 Just traditional Swedish Christmas meatballs. It all started with a trip to a local farm that sells (sadly only until the end of the year) beef, pork and lamb from animals raised and butchered on-site. Unfortunately, I didn't have my camera for the visit as it really should have been documented. There was a side of (nearly perfect) beef hanging in the fully visible back room as well as a handwritten whiteboard with the full processing information (weight, breed, slaughter date and location, grade, etc.) of the 8 steers that the farm had had butchered for the holiday season. 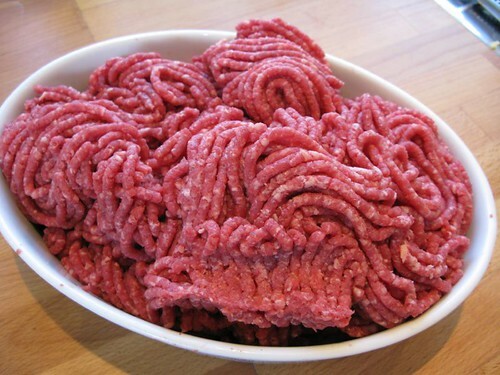 I grind my own ground beef but I couldn't understand why the couterpeople kept disappearing whenever another customer ordered ground beef until I realized that they grind every order fresh. 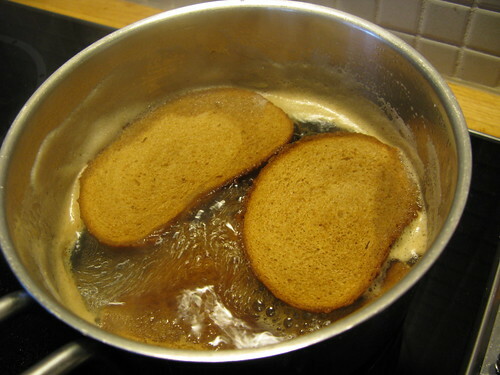 Start by pouring the stock over the breadcrumbs and letting them soak for a few minutes. 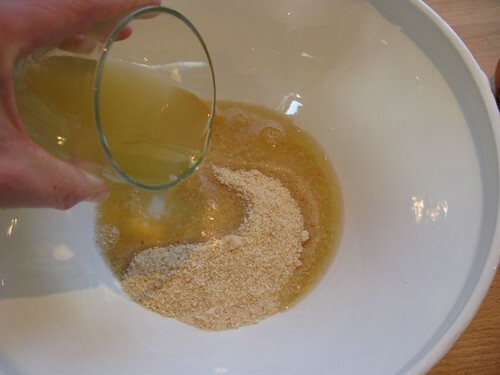 While the breadcrumbs are soaking, finely dice or grate the onion and fry (without letting it brown) in a tablespoon of butter or oil. Do yourself a favor and fry up a little taste of the mixture to make sure that the seasoning is o.k. 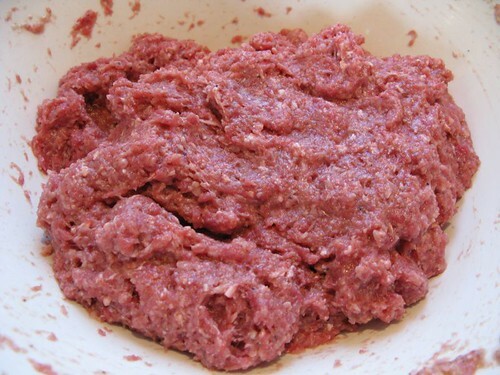 before making all of the meatballs. 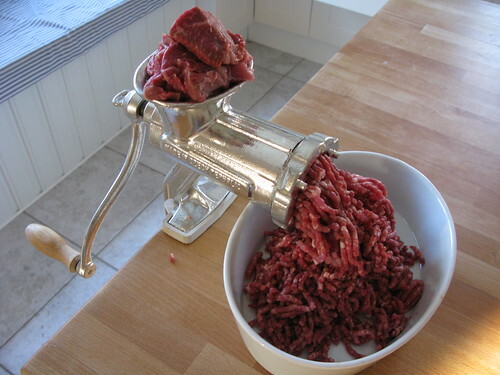 Now the tedious part - make the meatballs. I use a pastry bag to sqeeze out roughly uniform lumps of the meat mixture before rolling them into balls (with oiled hands) onto an oiled cookie sheet. 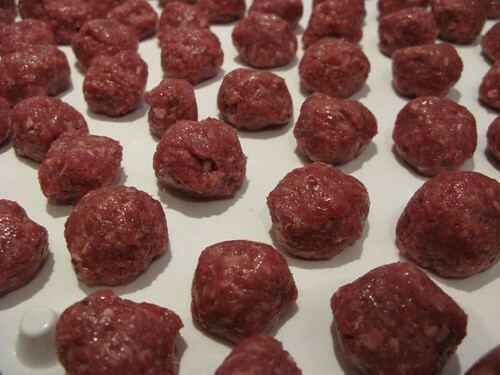 I froze last year's meatballs fully cooked last year but thought that the second frying of them (to defrost and warm them prior to serving) made them too dry. We'll see if this method works out better. 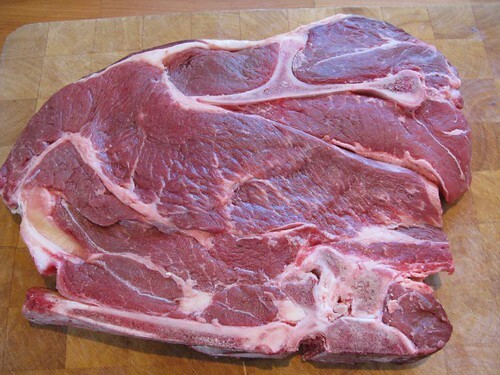 The cut of meat is a beef chuck 7-bone pot roast, which you can see pictures of here. Why is the farm no longer selling retail after year's end? Thanks, Cathy2! I was thinking that it was a 7-bone roast as that bone really is quite distinctive. I didn't ask why they were closing their little shop. I suspect one of two reasons: 1) they are perhaps getting too old and can't find someone to take over the place or, 2) tightening EU regulations could be making it too difficult for them to keep running the business like they want to or can afford. My favorite old-fashioned cafe on the island of Gotland finally closed shop as they could understand or afford to live up to tightening EU legislation. 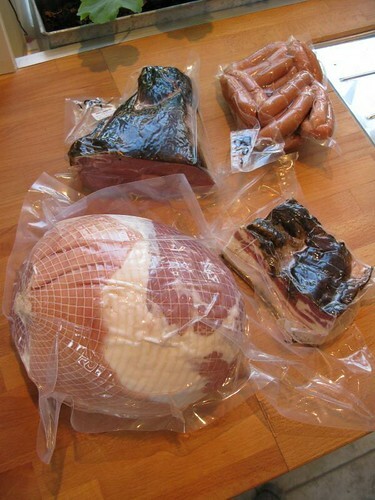 The good news is that the meat and products will still be available by placing an order and picking them up. They are only shutting down the open-to-the-public, drop-in butcher shop aspect of their operation. We'll see how the rest of the purchases turn out but I'm thinking that I'll be placing an order before too long. Bridgestone do you have a blog of your own? IHave you thought of starting one if you don't have one? I always really enjoy your posts. This is another great one. No, I don't have my own blog and I don't think I'll be starting one anytime soon. As long as LTHForum is willing to put up with all of my Swedish posts, I couldn't be happier posting here! Bridgestone wrote: As long as LTHForum is willing to put up with all of my Swedish posts, I couldn't be happier posting here! Very, very willing to wake up to learn about an American living in Sweden. Agreed. I love seeing all the different ingredients, and your kitchen seems to have the best natural lighting ever. 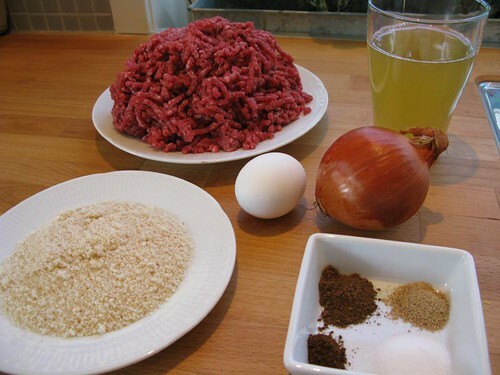 Bridgestone wrote: Just traditional Swedish Christmas meatballs. G Wiv's photos from the LTHForum 1,000-Recipe Potluck, June 22, 2008, appear here, including this great shot of Bridgestone's meatballs, as prepared by ronnie_suburban. 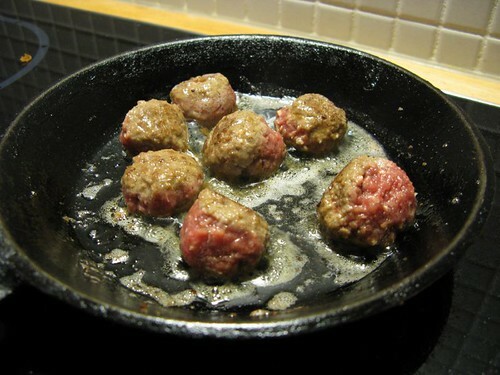 Ronnie also commented on making the meatballs. I only had a chance to take a few shots of this year's batch of Christmas meatballs but though I'd post here anyway as the ingredients were different. 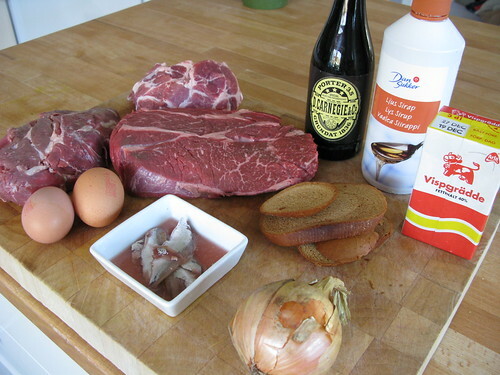 About 1/2 pound each of veal chuck/shoulder and pork shoulder, 1 pound beef chuck, two eggs, about 6 Swedish-style anchovies, 1 tbls liquid from the anchovies, one 33 cl bottle of porter/stout, a few slices of Swedish "vört" bread*, a few tablespoons of light syrup (I'd have used molasses if I'd have had some), 1/3 cup heavy cream, an onion. Not pictured: about 3 tablespoons of butter for softening the onion and roughly 1/2 tsp allspice, a few grindings of black peppar, salt (to taste) and about two ground star anise pods. Next, I finely grated the onion and gently softened it in butter for about 5 minutes. As the onion softened, I reduced the porter down to about 1/3 and added the bread. I let the bread and porter bubble until the bread had more-or-less become mush. 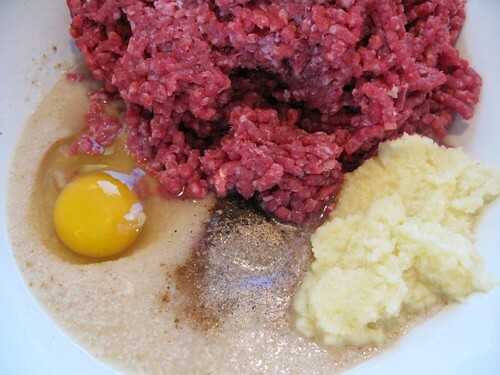 Finally, I add the softened onion, syrup, bread/porter mixture, cream and spices to the ground meats and mixed. 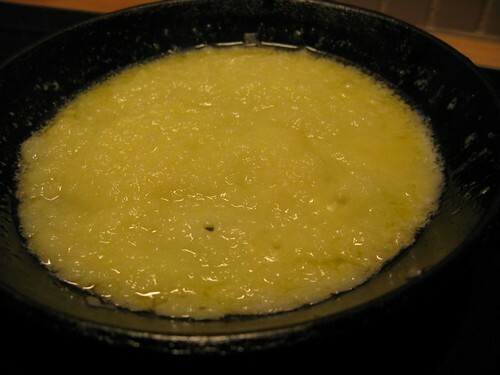 Of course, taste this mixture before proceeding to make sure that the seasonings are fine. I was trying to enhance the Christmas flavors with this year's batch and think I did pretty well. The heavy allspice of my previous batch was tempered by the maltiness of the porter and this particular bread. I was personally really pleased with the subtle licorice hints the star anise added but honestly don't know how many others noticed and/or appreciated it. The texture was very soft and creamy. This, I believe, was due to me taking a tip from ronnie_suburban and frying these very gently and not too long. In fact, I only made small batches this year preferring to roll and fry new meatballs as needed instead of precooking and reheating all of them at once. I will definately continue doing this as any hassle is well paid off in the taste and texture of the freshly cooked meatballs. *Swedish vörtbröd is bread flavored with, amongst other things, wort. The wort gives the bread a pleasant maltiness.